Last week, I wrote about Hemingway, the Blogger. To continue the famous-author theme, I’m sharing favorite quotes from F. Scott Ftizgerald — with interpretation through an author’s lense. “Never confuse a single failure with a final defeat.” These words should be tatooed across the top of the hands of every person pounding a keyboard in hopes of a literary contract. Remember, C.S. Lewis received more than eight hundred rejections before being published. Take heart and invest your “undiscovered” time perfecting your craft. “Cut out exclamation points. An exclamation point is like laughing at your own joke.” Although Fitzgerald would never admit it, he’s telling us to write like Hemingway. “All good writing is swimming under water and holding your breath.” Keep your eyes open so you’ll know where you’re going. Push through the pain. Don’t stop too soon. And wait until you surface to open your mouth. Watch, listen, and learn — then write truth about all of it. “I like people, and I like them to like me. But I wear my heart where God put it, on the inside.” Be courteous and a joy to work with. Be thick-skinned, take criticism, and accomplish the task at hand with grace. Be professional. PROFESSIONAL. “No grand idea has ever been born in a conference, but a lot of foolish ideas have died there.” Writing is, for all the agents and critique groups and guilds and editors, a solitary journey. If you don’t enjoy being a hermit, you might want to pursue another dream. Writers face their demons alone. Stay true to yourself, but prepare for the market to reject you and your work. “…the redeeming things are not happiness and pleasure but the deeper satisfactions that come out of struggle.” Reworking a chapter (or more). Receiving an excellent-but-brutal edit (that transforms your manuscript). Hearing that your novel made it to the publishing board (before being dismissed because your heroine was “too atypical”). Fitzgerald insanely overstates the satisfactions of struggle, but I like the quote. Master “struggle,” and you’ll survive. I’d turned on the in-floor heat the night before because lows were supposed to be in the thirties. The cat, a refugee from our daughter’s “college experience” — whatever that is, because as an engineering student, all she does is try to pass — was testing warm spots that morning, trying to remember where they were as winter approached. 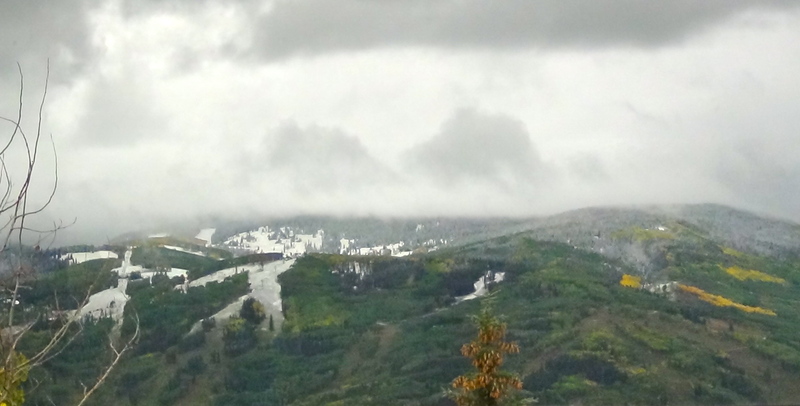 Clouds hugged the valley floor and narrow chasm my office overlooks. 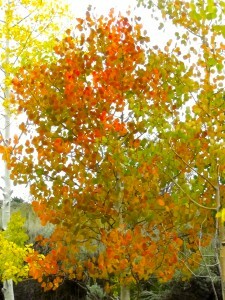 Aspen leaves, mostly still green because we’ve been warm and rainy, wore the ocassional burst of pumpkin and marigold. Cedar waxwings, perky birds that migrate through twice a year, flocked in the meadow consuming serviceberries and snowberries at a manic rate, trying to beat the bears to autumn’s deliciousness. Bears, meanwhile, enjoy a 30,000-calorie-a-day diet preparing to hibernate, and we avoid getting between the beasts and anything edible. 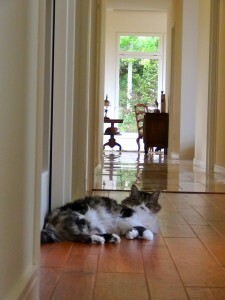 Two mornings ago, wood smoke from someone’s fireplace awakened me. As I fly fished a mighty river last week, I rounded bends enticed by the sweet scent of fall foliage. And the slow cooker, hunkered in the pantry corner since March, produced some of the meatiest short ribs ever while filling the house with the welcoming aroma of braised beef — a winter feast for us. I welcome the change, even if it always seems to come too soon. 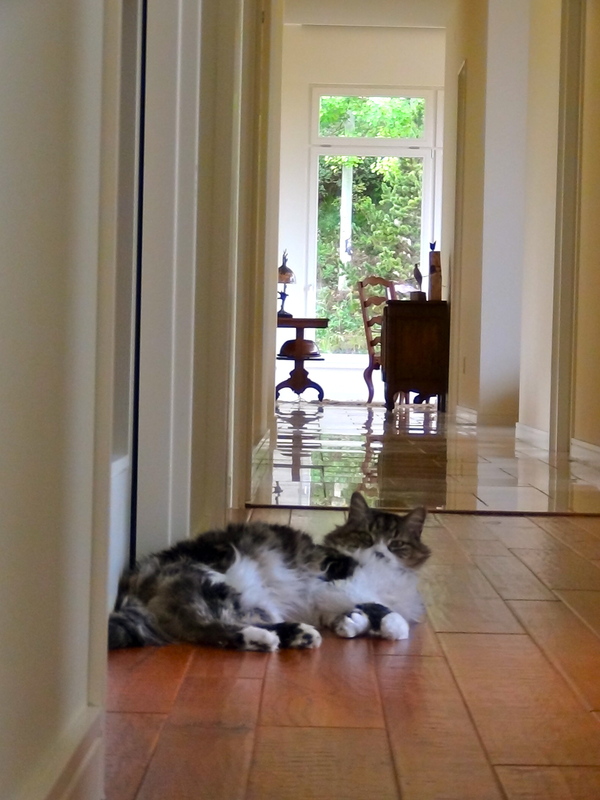 Hemingway and I have much in common: we catch big fish. And we…well, we don’t have THAT much in common. But if Hemingway were alive, he’d be a great blogger (when sober). Here’s why. Pick Your Turf. Hemingway enjoyed bullfighting, women, and wine. The latter two weren’t unique topics, but bullfighting was. As were deep-sea fishing and boxing. 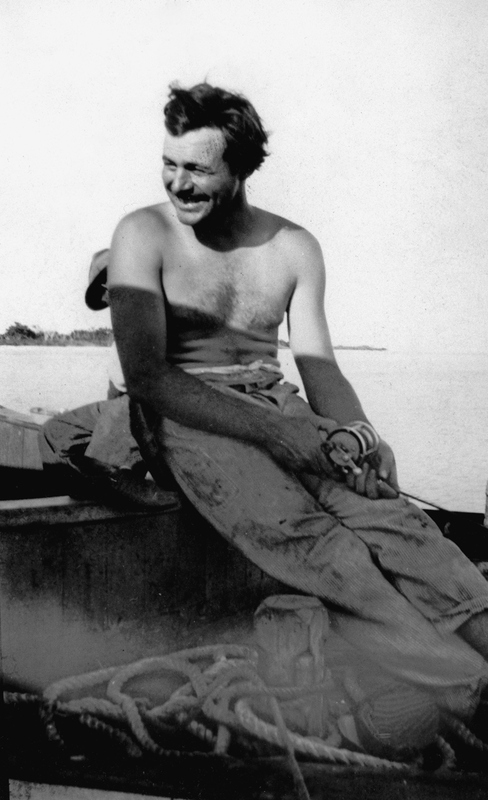 Hemingway’s manly tales positioned him as a spokesman for the all-American male. Contrast his work with Fitzgerald (the elitist) or Joyce (the pervert), and Hemingway represented the rough-and-tumble world of sportsmen. To bond with readers, establish your turf. In Two Words: Short Sentences. Blogs should be short. Apply the “scroll rule.” You’ve written too much if scrolling is necessary. Posts are fortune cookies. Thoughts should be to the point. With good takeaway. Readers finish short posts. Set the Hook. As a fisherman, Hemingway knew how to set the hook. Look at these first lines. Then emulate their strong sparseness to begin your blog posts. Truth. Research truth, then write it. To quote Hemingway, “All you have to do is write one true sentence.” Then keep writing them. Better yet, live your topics. In either case, ensure your posts exude truth. Write Every Day. Hemingway wrote every morning, standing. Then he ignored his work until the next day. A habitual writer, he knew practice led to better work — and made his editor, Maxwell Perkins, happy. Be disciplined so your readers depend on your posts and thoughts. To establish some ground rules, I am fiscally conservative, theologically liberated, and generally non-partisan. I’m a capitalist, give to charities serving widows and orphans, and believe a good education cures most woes. This blog post doesn’t serve a political agenda, although it has political overtones. Proceed at your own risk, but polite comments are more than welcome. The author states that Syrian intervention is one of very few issues on which Christians around the world agree: they don’t believe the U.S. should launch military action in response to Syrian chemical weapons. The author offers reasons why evangelicals who supported the Irag war a decade ago are largely against intervention in Syria now. It cites political (partisan) nonsense, a weariness of war, and a growing (barely, but we can hope) global mindset. The article also, interestingly, cites a waning of support for Israeli dispensationalism. In other words, and these are my words, Americans care less about ensuring Israel keeps “the land,” and therefore are less supportive of doing whatever it takes to ensure the Jews aren’t bombed out of their sliver of the Middle East. History there, including land possession, is a complex affair tumbling back well more than 5,000 years (that we can reasonably document). Nothing is straightforward or easy when looking at whose twelve-times great ancestor owned what. I can’t forget the phrase “identity-based violence” when thinking of a region embroiled in tribal warfare for millenia. To be fair, we have horrific violence in the States, largely perpetrated by identifiable demographics. And I know a number of individuals in the Middle East who are fine, upstanding citizens. But, like many, I’d like to see a region-wide approach to democracy, equality, and first-amendment rights — all inarguably Western ideals — in the Middle East before more American blood is spilled on those desert sands I love so much, or on behalf of individuals crossing those sands. Maybe I’m simplistic, or maturity is causing my heart to become more isolationist as the rest of me goes global. But change in the Middle East has to start from within. And as I think of being my brother’s keeper, I don’t want to find myself Abel to the Middle East’s Cain. I read a book review this week of The Scientific Methods of Sherlock Holmes by James O’Brien (http://bit.ly/1evoxUO). The article reminded me of similarities between great detective work and good writing. FINGERPRINTS. An author can easily leave fingerprints all over a manuscript. A detective like Holmes used fingerprints to identify a suspect, but I try to mask my fingerprints so I don’t remove readers from my stories. I want readers to relate to my characters, so strive to remain invisible — just like the thief that makes off with a van Gogh, or the Pink Panther jewel syndicate that “lifted” diamonds at the Cannes Film Festival this year. I believe an author shouldn’t leave fingerprints. TYPEWRITTEN DOCUMENTS. Holmes knew each typewriter had a unique signature; that typewriters don’t produce exactly the same “type.” Especially in the internet age, false facts can infiltrate truth and corrupt research. When I do background work for each manuscript, I cross-reference to ensure I’m getting a factual consensus instead of a one-off opinion that can discredit my entire tale. I believe an author should validate his or her sources, then triple check them. HANDWRITING. Like a typewriter creating a singular typeface, I work to ensure the “handwriting” of each character is unique. Physical characteristics, speech patterns, vocabulary, reactions — all these bits of “handwriting” lead readers to my character’s place of birth, education, gender, or station in life. These facets enable a reader to understand how the character relates to the tale, and why he or she reacts in certain ways. I believe an author immerses readers by building complex, thoroughly believable psychological profiles for each major character. FOOTPRINTS. My characters leave footprints even when absent from a scene. 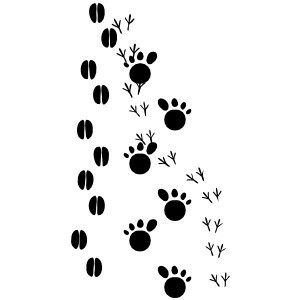 I think of footprints as an action in a previous chapter setting up the next. Or an interaction between characters pulling the story forward — even if I leave one character behind in the progression. Just as Holmes relied on old footprints to solve crimes, readers rely on characters’ footprints to understand the story and context. I believe an author should leave a trail of footprints to lead the way through a manuscript. DOGS. Holmes and dogs — a perfectly English match made in heaven. The detective used common things in uncommon ways, such as employing a dog to determine if a woman in a carriage is a dog’s owner, or an imposter. 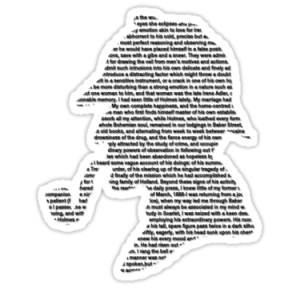 By doing the unexpected, Sir Auther Conan Doyle tricked his reader into complacency before surprising them with a story twist. I believe an author should reveal the unusual in the everyday.